Mesh Current Analysis Method is used to analyze and solve the electrical network having various sources or the circuit consisting of several meshes or loop with a voltage or current sources. It is also known as Loop Current Method. 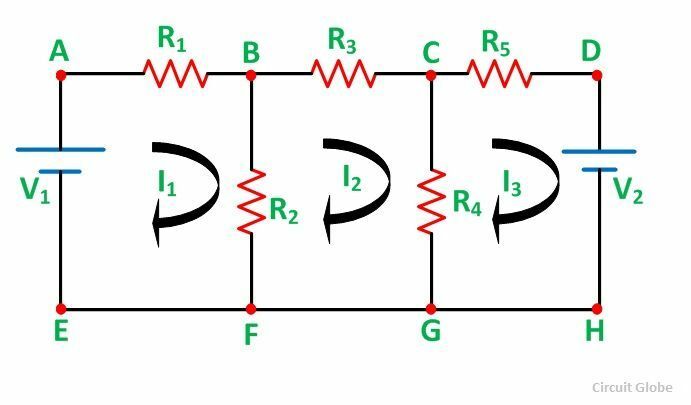 In any closed circuit, the net voltage applied is equal to the sum of the product of current and resistance or in another word in any closed circuit, the sum of the voltage rise is equal to the sum of voltage drop, in the direction of current flow. The direction of the current is assumed in the clockwise for simplicity in solving the network. Considering the above circuit diagram, the following steps are given below to solve the circuit by Mesh Current method. Step 1 – First of all, identify the independent circuit meshes or loop. .As there are three mesh in the circuit diagram shown above which are considering. Step 2 – Assign a circulating current to each mesh as shown in circuit diagram where I1, I2 and I3 are flowing in each mesh. It is preferable to assign the same direction of all the currents and in a clockwise direction for making the calculation easier. Step 3 – Now, write KVL equation for each mesh. Step 4 – Now solve equations (1) (2) and (3) simultaneously to get the value of current I1, I2 and I3. By knowing the mesh currents, we can determine the various voltages and currents in the circuit. Thus, the equation (4) can be solved to get the values it the various currents. It is seen from the equation (4) that the resistance matrix [R] is symmetric, i.e. [V] is the column vector of the algebraic sum of all the source voltages around the mesh.